If you’d like to own a swimming pool but aren’t really that interested in swimming and are short on space, then going for a plunge pool should be right up your alley. Plunge pools are extremely popular among Generation X and Baby Boomers and are the perfect solutions for small homes with little space. A plunge pool is a small pool that isn’t that deep. Unlike larger swimming pools that are built for swimming, a plunge pool is built specifically for the purpose of wading, lounging or just cooling off after a long day. Since newer homes are built on smaller lots, opting for a plunge pool is a unique way to save space and be the proud owner of your very own pool. No more filling out forms at water sports facilities just to use their pool. There is no definition of a plunge pool, other than it is a small, shallow pool that is restricted when it comes to swimming laps. Instead, it is known as a small pool that allows you to cool off by “plunging” into the pool, hence the name, plunge pool. As anyone who has had the opportunity to enjoy naturally occurring plunge pools, (those beautiful pools of water at the base of a waterfall) will tell you, they are the perfect width and depth for wading or lounging around. In the pool industry, a plunge pool is used to identify a pool that’s larger than a spa, but smaller than a swimming pool. Normally, plunge pools measure between just four to seven metres in length and two to three metres in width, and are no deeper than 1.2 meters. As a rule of thumb, any pool that’s smaller than 6m is considered as a plunge pool. When it comes to getting these little pools, there are no hard and fast rules on their design. If you’re confused and want a visual take a look at the image below. The popularity of these pools is because of their small, convenient size, which doesn’t take much space in your home, and are much easy to maintain. Since a plunge pool is relatively small as compared to a swimming pool, it also means that less water is used, which is a smart choice for everyone thinking of the environment and sustainability. When it comes to a plunge pool, the common misconception is that since they are so small in size as compared to the much larger swimming pools, they must be a lot cheaper. Unfortunately, that is not the case. In fact, the tight spaces that a plunge pool is designed in often bumps up the price tag. Besides, if you are opting for a pool that is between 5m to 8m then additional costs such as getting a permit, dig duration and the installation of the site is only slightly less as compared to the cost of an average size swimming pool. Additional features that can raise the price of a plunge pool include the popular swim jets and exercise machines, spa jets etc. For instance, additional features that are added to the plunge pool to personalize its design, such as exercise jets, can add an additional $7,000 to the total cost of the pool, depending on the pool size and device brand. Seats are normally not installed in plunge pools but it doesn’t mean that they can’t be installed. Again, it all depends on the owner. Some people like to lounge in their pool, and install specially designed seats or work in seating arrangements into the design of the plunge pool. A plunge pool can be heated or not heated, depending on the personal preference of the homeowners. That said, many homeowners who decide to get a plunge pool often go for an infloor circulation and cleaning system, which is an extremely popular add-on for a plunge pool. While installing an infloor circulation and cleaning system in a small pool might be viewed by some as a waste of money, there are actually a few advantages of having the system installed. Since a plunge pool is normally positioned in a way that makes it the centre of attention once you enter your home, it should been clean at all times. Nobody wants to have a dirty pool in the centre of their backyard. Another benefit of using an infloor circulation and cleaning system in a plunge pool is that many folks opt for gas heaters or electric heating pumps for their pool. The infloor circulation and cleaning system allows heat to enter the pool through the floor, resulting in a quicker heating of the pool. Typical prices for a 5.2m x 3.4m fibreglass plunge pool ranges between $35,000 and $50,000— depending on the size of the pool and the additional features that have been added to personalise it. Also, we recommend another article in the advice section to learn more about pool prices. So, why go for a fancy-pants plunge pool when you can just get an above-ground portable pool at Target? While that’s certainly an option, but, (you knew there was a ‘but’ coming!) above ground pools don’t share the same robust design and strength which is required in a plunge pool. Except for the durability and design, the cost and time to clean the poo should be considered. The Vantage in-floor cleaning system is unique to Compass Pools and cannot be installed to any cheap above ground pool. Apart from the hefty maintenance fee you would have to fork up every month, there also the problem of their shape. All above-ground portable pools come in only two sizes, round and oval, so if you’re looking to find a square pool, you’re out of luck. When it comes to the appearance of a home, the above-ground portable pool doesn’t do much to enhance the value of your property or its appearance. Above all, did we mention that an above-ground portable pool can only be used in your backyard and not indoors? This might be not relevant to many future pool owners but some of them are considering having the pool installed indoors. Also, a plunge pool can be designed into the architecture and landscaping of your home to make it the main focus point, which significantly improves its overall appearance. It’s common knowledge that the money spent on an above-ground portable pool is not recovered in the valuation of a home during a sale, making it an asset that depreciates. Compared to that, a plunge pool’s value adds to the purchase value of a home during a sale. Finally, while an above-ground portable pool can be a good low-budget option for those who have kids and want to have a pool the kids can splash around. A plunge pool, however, is the preferred choice also of those who are little older and are looking for something that’s nice to look at and don’t want to settle for a puddle of water trapped in vinyl. When it comes to aesthetics, there’s really no comparing between the two because the fibreglass plunge pool is going to win every time. Our plunge pools can be installed as inground pools which is the most common scenario. Also, did you know that we can built your new plunge pool partially or even completely above the ground? If you’re still on the fence, on whether or not you should get a plunge pool, then it’s time you read the following reasons why you should give it a fair consideration. One concern that some homeowners have when making their mind on whether or not they would like to have a plunge pool is its usability. The good news is that the versatile design of the plunge pool means that it can be used all through the year as your own personal spa. Unlike conventional swimming pools that can’t be used during the cold winter season, plunge pools are smaller in size and built into the architecture and landscaping of your home. This means that they are cheaper to heat and can also feature all the goodies of traditional spas, such as bubblers and jets. Those who like to stay fit by exercising can also add swim jets to their plunge pool. In this way, you can be sure that your plunge pool will be in use all through the year. A plunge pool that is designed well can be used every day of the year as a relaxing place to cool off or as a nice warm spa. Compared to the traditional swimming pools, a plunge pool uses up to 80% less water, and that’s not all. The variable speed pumps that are used for plunge pools are smaller and more compact, resulting to the use of up to 80% less energy as compared to the standard pumps that are used in larger swimming pools. Rather than unloading packets of chlorine to clean the small pool, using salt water chlorinator offers not only cleaner water, it also comes along with therapeutic benefits. Overall, choosing a plunge pool is clearly a justified decision, as compared to traditional swimming pool since it uses less energy and less water. One thing that’s required of a plunge pool is a reliable heating system. This can help maintain the temperature during those unexpected temperature changes due to a change in season. Having a heating system will ensure that your pool stays at an optimum temperature always. 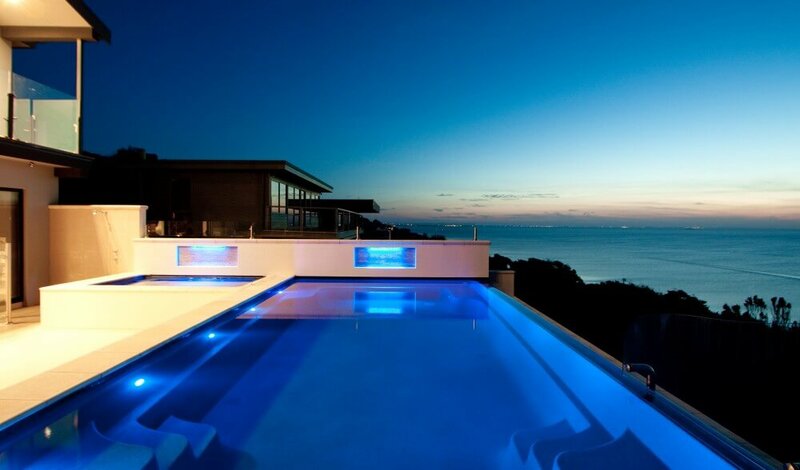 Most plunge pools come with an electric or gas heater. 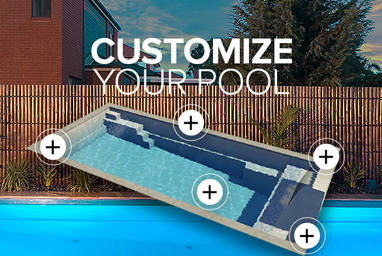 Also, your fibreglass plunge pool can be built as a smart pools. The smart pools concepts considers the requirements to easily control and maintain your pool, using intelligent devices and the self-cleaning system. One of the best parts of going for a plunge pool is its versatility when it comes to the design. If you plan on using a plunge pool in the garden or backyard, then it can be easily integrated into the landscaping. Many homeowners who want to install a plunge pool outside their home often add a water feature, such as a water wall or a sheer-descent water feature. This way, the plunge pool can also double as a water feature as you relax in the plunge pool. Since all plunge pools are not created equal, the results can be only as good as the designer you choose. Before you decide on a plunge pool design, shop around until you find the best value for your money, not only in terms of the one-off purchase price but the overall value of the pool project. Although not very typical, our plunge pools can be built as infinity pools, too. This can create beautiful effects of infinity views over the edge of your plunge pool if the pool is built on a sloping site. Get in touch with us today to get answers to all your questions by contacting us at (03) 5571 1033 (Hamilton) or (08) 8725 2826 (Mount Gambier). You can also request a free quote by sending us an inquiry. All you need to do is fill out a simple form. 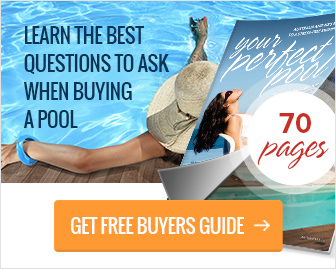 If you’re planning to buy a new pool then get your hands on our Free Pool Buyers Guide to get all the information you need.